MANILA, Philippines - The official results, list of passers, top examinees and other important announcements for March 2018 Civil Service Exam - Pen and Paper Test (CSE-PPT) both for professional and subprofessional levels are released by the Civil Service Commission (CSC) within sixty (60) days after the eligibility examinations. 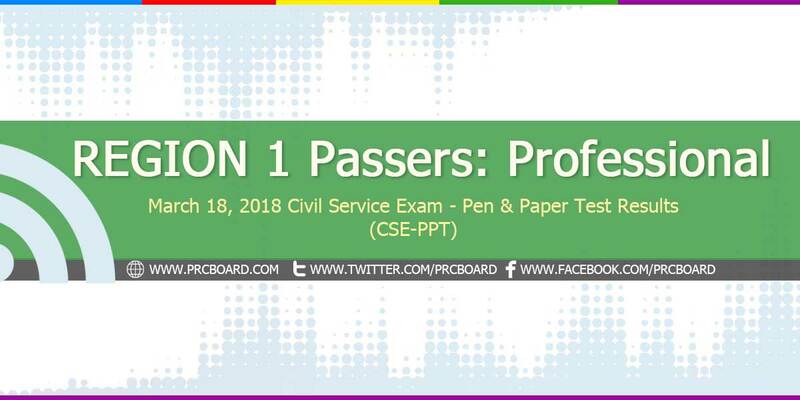 Below is the complete list of passers for March 2018 CSE-PPT Professional Level in Region 1 (Ilocos Region). buhay pa ba ako ? Lord god...sana kahit isa samin ay makapasa na..
Oo mas madali pag may kakilala. kelan kaya ipopost ang result? RELEASE NA POH PARA MAGKAALAMAN NA POH..
May 14 to 21 pa ang expected posting ng list of passers. Not true. Civil Service Exam Results for March 2018 are expected on or BEFORE May 17, 2018.
maghintay nalang po tau. Sana nga po pumasa taung lahat. Lord :) Please po, ipasa nyo kmi (idamay nyo rin ako Lord, please po) Amen. kelan po ang release ng result? huhuhuhuhu kinakabahan na ako ..
Updating, stand by na daw guys. Oras nalang, i can feel it. Lord, San yung susunod na magcocomment dito hindi makapasa. Amen. KUMUZTA ANG MGA BAGSAK JAN?